Email deliverability is all about how you measure the success of your emails reaching the inbox without bouncing, or being marked as spam. And At Octane, we are very serious about email deliverability. A program that is used to filter out the unwanted emails and prevent those emails from getting to the recipient’s inbox is known as “spam filters”. According to our annual research report, India Marketers chose Increased Personalization & Targeting (75%) and Rephrasing message titles and subject lines (54%) as the key activities they undertook in 2016 to ensure that customers find their emails relevant. Just don’t! From time and again we have been stressing on “permission based marketing” because not every list will be relevant to you and might result in increasing your bounce rate and the chances of you being marked as spam. Here’s something that might help you increase your opt-in list. A double opt-in is when the subscriber signs up, a confirmation email is sent to their email and they must click on the link provided to confirm their addition to the mailing list. Double opt-in protects your list from bots and ensures that your subscribers are real people who want your emails. Try keeping your message short, crisp and relevant to your subscriber. Segmentation of your subscriber’s list will take you through this. Try to “pull” your subscribers with your content. Another thing you should emphasize on, are the audio-visuals of your mailer. Try and stick to 60:40 ratio of text to visuals. Also do not use spam phrases in your subject line! Phrases like “free”, “refund”, “best offers”, “cash bonus” will successfully land your email in the spam. Be careful about using a subject line with all CAPITAL letters and symbols. Use subject lines that will pull your subscribers to read your entire mail. Tips, tricks and the Importance of Subject Lines. Timings work differently for different people. Best day to send out campaigns is Tuesday followed by Wednesday and Thursday. Send out campaigns at the right time keeping in mind the product you’re offering (only if you don’t want your emails to be ignored). Don’t forget to A/B test your email campaigns before sending it across. 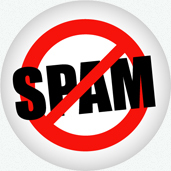 And follow the above tips to avoid the “spam demon” contaminating your email campaigns.